It was down in Paso Robles that we’d first heard of a secession plan to take the northern part of California and the southern part of Oregon and make it into a 51st state named Jefferson. Funny that we’d just now heard of it, since the idea had been hatched way back in 1941. It sounds like it’s an idea that has been there ever since, but has gained more momentum since the Tea Party came about. The area is heavily Republican, and I get the idea that is a big part of the problem with both California and Oregon being more Democratic as a whole. 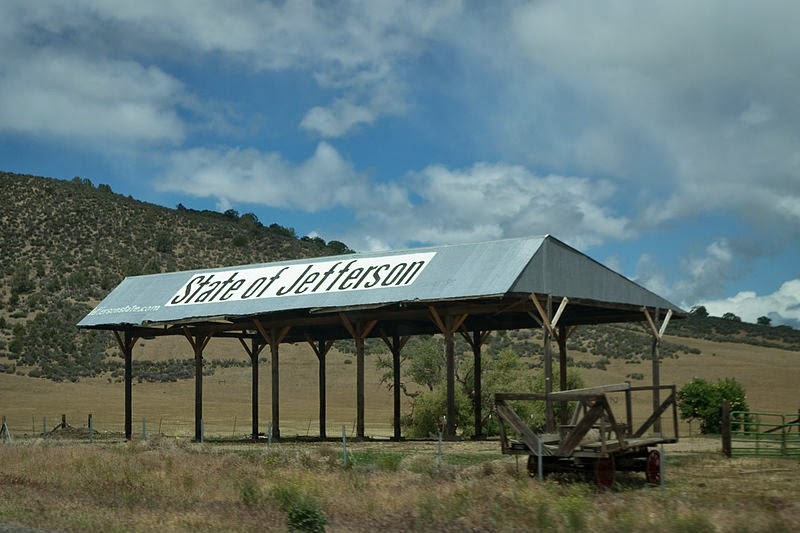 Up along the east side of I-5, just south of Yreka, the proposed capital of Jefferson, there is a barn proclaiming the area as “State of Jefferson”. We suddenly clued in. This was the area we’d heard of! 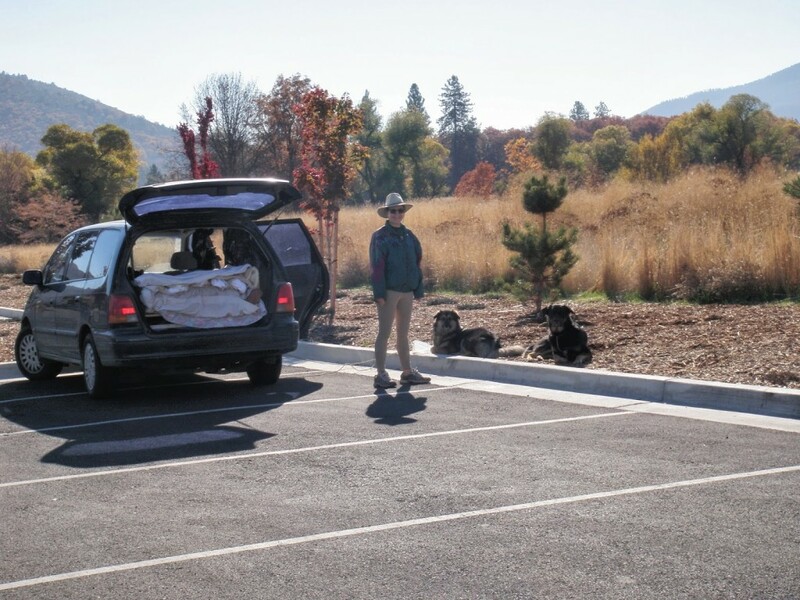 We met up with my parents in the Walmart parking lot in Yreka. 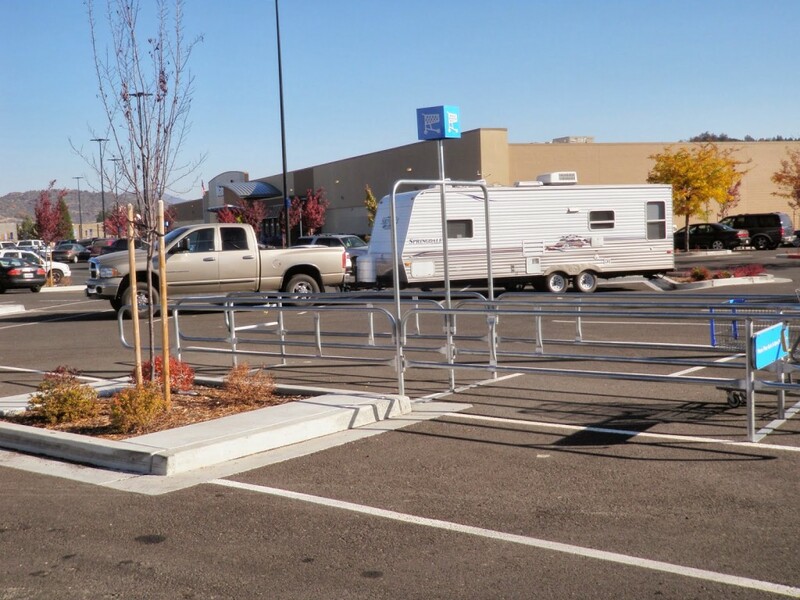 I got out to direct Harold into where we should park, and a large, hairy man wearing a little pink skirt came up and started to ridicule our skills. I wasn’t sure whether to be aggravated at his rudeness or amused at his get-up. I settled on both and tried to ignore him. After we were settled in, he then tried to hit us up for cash, which I had no problem in declining. First rule of pan-handling: don’t offend the mark. We were awoken at about 4am by one of my clients in trouble. Since my laptop battery is no longer holding a charge, I need the generator going constantly to run my computer. I have learned to save very, very often as the moment the generator runs out of gas, I lose everything. I looked out the window to see a motorhome parked beside us, and was thinking we’d have to move somewhere to put on the generator, but lucky me, they started up the engine and left as I stood there watching. My parents left pretty early and we stayed longer. I wandered around, checking out the people who had stayed overnight around us. The woman parked behind my parents was from Saltspring Island, BC. She, and her husband, used to travel in a Class A motorhome, but he died a few years ago, and she sold it. She, and her two dogs are making their way down to South America, in this minivan. 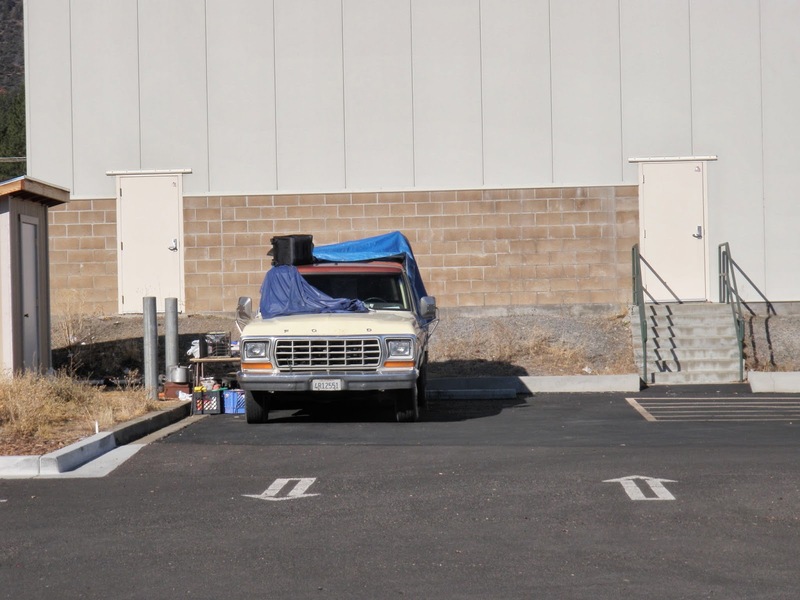 The people in this truck turned up late the night before and pulled a ton of stuff out of the back of the truck, in order to make room to sleep. They had a huge spotlight that lit up the whole area. 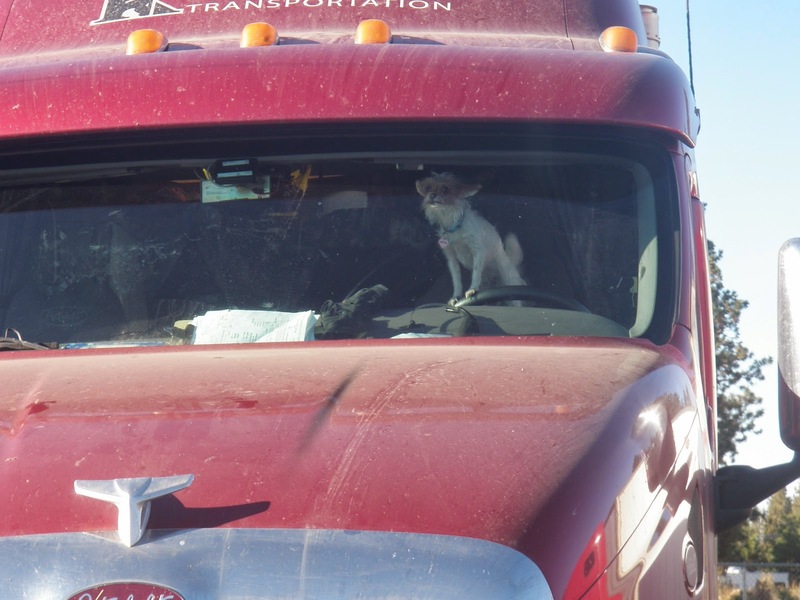 They had three big dogs they left in the front seat that kept looking up to make sure we kept our distance all day long. 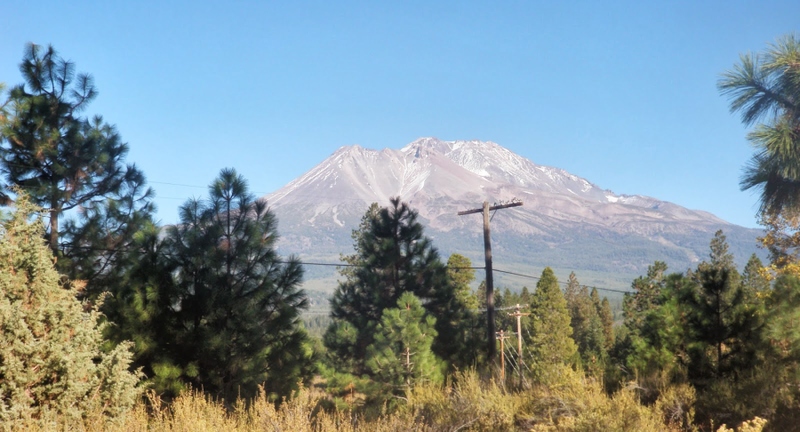 The Mount Shasta area is so beautiful and is sunny every time I’ve gone through. I’ve never spent much time in this area but we definitely need to in the future. Not sure what happened in my comment to put all those spaces in between the words. I remember thinking it sounded like a great idea myself, since we have so much more in common with the Pacific Northwest states than anywhere else in Canada but I think that's us comparing the larger cities, and forgetting that the rural areas get a lot more conservative. I don't think I'd ever honestly support secession. I love being Canadian. The Cascadia Bioregion is also referred to as the Pacific Northwest Bioregion and encompasses all of Washington, and portions of Oregon, Idaho, California, Nevada, Wyoming, Montana, Alaska, British Columbia, and Alberta. Bioregions are geographically based areas defined by land or soil composition, watershed, climate, flora, and fauna. The Cascadia Bioregion claims the entire watershed of the Columbia River (as far as the Continental Divide), as well as the Cascade Range from Northern California well into Canada. The delineation of a bioregion has environmental stewardship as its primary goal, with the belief that political boundaries should match ecological and cultural boundaries. Cascadia was also the proposed new country made up of Washington, Oregon, portions of other US states, and British Columbia. There were also larger plans for bringing in Southeast Alaska, Northern Californi, and parts of Idaho, Western Montana, Wyoming, and Yukon. I think we're supposed to call the Pacific Northwest area Cascadia now. Wasn't that decided in 2012 or 2013? It's hard to remember.